I don't know whether to love or hate this book for being so inspiring. Many times while reading it, I had the impulse to close my gallery, stop writing this blog, and return to making art. 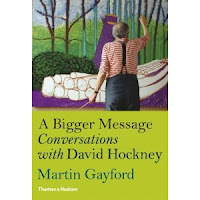 Martin Gayford's A Bigger Message: Conversations with David Hockney chronicles discussions between the art critic and artist over a ten year period, giving the reader unique access to this inventive artist's process and his ongoing experimentation with new media. Why does this book make me want to make art? Because Hockney has never stopped seeing, has never lost touch with the primacy of making marks and striving to represent reality in ever more vivid and inventive ways. "I thought one of the saddest things ever was the abandonment of drawing in art schools . . .You can't teach someone to draw like Rembrandt, but you can teach them to draw quite competently. Teaching someone to draw is teaching them to look. When it was given up, I kept arguing with people. They said we don't need it any more. But I said that giving up drawing is leaving everything to photography, which isn't going to be that interesting." "This is a real new medium. You miss the resist of paper a little, but you can get a marvellous flow. There are gains and losses with everything. So much variety is possible. You can't overwork this, because it's not a real surface . . . You can put a bright, bright blue on top of an intense yellow. 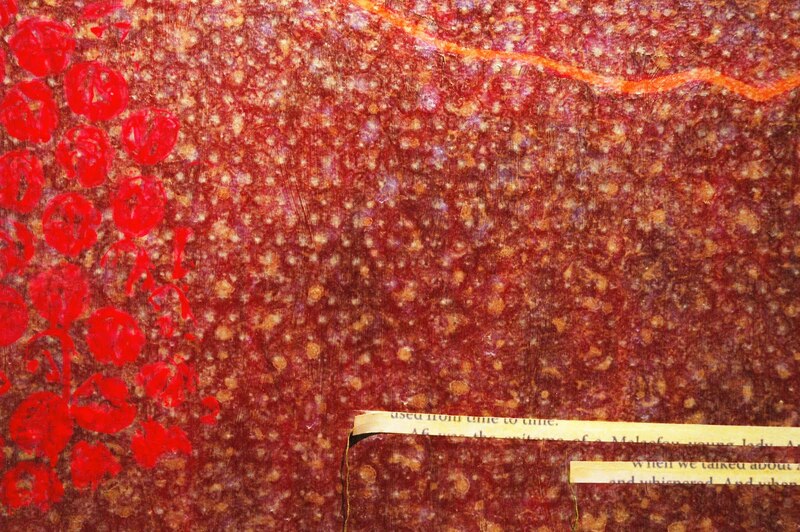 But you still have to think in layers as you do with lithographs, watercolours, any kind of prints. But there are other big differences in how you can work. The iPad is like an endless sheet of paper. You can adjust scale for ever." A Bigger Message: Conversations with David Hockney is a fun and insightful read, richly illustrated with reproductions of Hockney's and other artists' work, as well as photographs of the artist working. We see Hockney at the height of his artistic powers, bringing to picture-making the accumulation of a lifetime of seeing, working, studying and always moving forward. As for me -- am I going to close up shop and return to making art? Not today, but I could try to carve out some time every morning for an iPad drawing . 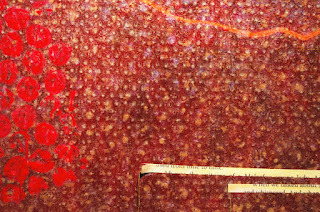 . . or wait for the feeling to pass. I bought this book a the College Art Association trade show and never cracked it open--so thanks for the nudge. I love what he says about drawing and it makes me proud that I have spent the last 17 years teaching Beginning Drawing. Make some time Jane - I'm really curious what will come out on the 'page' these days. I'm sure it will be interesting and likely lovely as well! Totally agree with Hockney on drawing. Students who don't take drawing classes are missing out on a great experience, whether they go on to become artists or not. Why wait when you can draw anytime, any place and with anything that is available to you? I have learned to draw while waiting in offices, in my car, looking out my window, and on our porch. I never erase a line either, because they tell me where my focus was in that moment. One day a few months ago I started to get Jane's blog. Not curious enough to open it but intrigued enough to let it arrive, I did not identify it as junk mail. I am glad I opened it today, because I too have taught drawing, my art practice involve a lot of drawing in preparation for my paintings and I am thrilled to see that the importance of drawing is not diminished in your blog. I have seen David Hockney's monumental paintings at Pace in NYC. They do have an overwhelming, transcendent presence. Trained as an Architect and now a Painter,in Architecture school we were taught early on that drawing is the fundamental activity to designing. Architects always draw as they discuss the project and I have been so accustomed to this that indeed I take it for granted. When I began painting the drawing skills allowed be to grow as a painter and it remains a source of exploration, a way to ask questions and at times these images become stand alone pieces. Nothing is more pleasurable than drawing.Seriously. Don't wait for the feeling to pass ...! I loved reading this book (as well as the other books by Gayford which give a special insight into the lives of several artists in particular Van Gogh/Gauguin and Lucian Freud) and was pleased to discover this side of Hockney's work and the fact that he actually took the step to start using an iPad for making serious art adding a whole new chapter to his work. Looking forward to his Bigger Picture-show in Cologne in the autumn. Thanks for posting this review and your contemplations! It's mystifying, pathetic and absurd that drawing has disappeared from art education; this would be like taking ovens out of cooking school. As an artist and designer who is also a teaching artist I have seen how children WANT to learn to draw and WANT to connect to life in this way. But then that disappears and then as "adults" they make objects of total vapidity (without the benefits of drawing skills) that are completely alien to both children and common sense. While it's great that Hockney emphasizes the importance of drawing, an Ipad is NOT the same as drawing in reality; it is merely a re-presentation of reality. There is "feedback" that comes from actual interaction with the tangible surfaces of reality. The flows of watercolor on paper, for example, are influenced by more than just visual perception -- there are other senses involved, as well as forces of gravity, temperature, etc., that influence the artist during the creation. (This has actually been proven by neuroscience in studies that show that the brain is unconsciously aware of virtual-versus-real representation.) The Ipad might be convenient and makes Hockney seem relevant (obviously his main intention), but it is a digital re-represented that continues the alienated postmodern disconnection that is our current milieu. Just compare Hockney's Ipad "art" with his drawings from the mid-1960's and I think it's evident that digital disengagement is not conducive to art. I am looking this video very good collection and your art and I really enjoyed learning about David Hockney.